Welcome to our Ischia blog, Good Morning Ischia! Here you can see the entry for Friday 15th November 2013. Well there could hardly be a greater contrast between yesterday and this morning. Yesterday we woke to bright sunshine but today it's turned a bit grim with heavy rain showers overhead. This afternoon looks equally unpromising with more rain predicted although there is the chance of some sunny spells according to the forecasts. Today's maximum temperature should be around 20° celcius (68° fahrenheit) and the minimum for this evening around 17°C (63°F). Today's photo is of two glorious pine trees in Casamicciola, framing the view down to the port of its neighbouring town, Lacco Ameno. 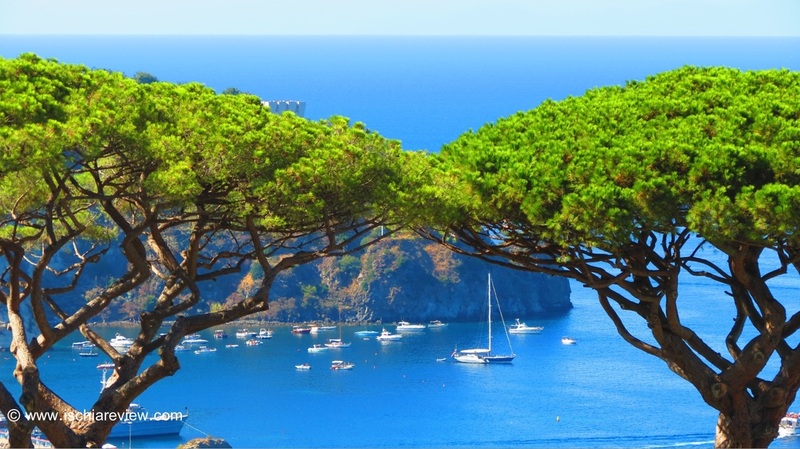 The tall pines are a feature of Casamicciola and of Ischia in general, and their elegant looks add to some of the most beautiful scenes that can be viewed on the island. Casamicciola is one of Ischia's six "comune" and lies between Ischia Porto and Lacco Ameno on the main SS270 road that circles the island. The full name of the town is "Casamicciola Terme" as it was one of the first places on the island where thermal water was discovered. Incidentally, the word "terme" means "spa" in English and you will notice that many hotels in Ischia have the word somewhere in their name. This is important to note as it means in most cases that the hotel has its own thermal water or wellness spa. Legend has it that the town's name derives from the curative powers of its thermal water. It is said that a wealthy Italian lady of the aristocracy once visited the town having heard great things about the water and was told that it could be the remedy for her problematic "bow-legs". The lady in question was known as "Nizzola", and when she returned to the mainland with her problem seemingly cured, word got round and the town was subsequently named "Casanizzola" (house of Nizzola), which over the years changed to what it is today, Casamicciola. The town shot to prominence in 1883 when a devastating earthquake hit the island and almost completely destroyed the it. Other parts of Ischia were also damaged such as Lacco Ameno and Forio but the worst of the impact was felt in Casamicciola as it was razed to the ground. Around 3,000 people were said to have lost their lives on that fateful summer's day of 28th July and the disaster was reported around the world. It's interesting to read an article from the New York Times on the following day which reported "the terrific shot was first felt at around 9:30 o'clock when the majority of the people of the upper classes were at the theatre". To this day the earthquake and its destruction are remembered both on the island and also in colloquial Italian language, the phrase "é successo una Casamicciola" (a Casamicciola has happened), derives from the events of that terrible day and roughly translates as "a disaster has happened". Thankfully, modern geological measuring systems make a repeat of the disaster unlikely as the whole region's geological and volcanic activity are closely monitored around the clock. Casamicciola is also known as being the home to Castiglione Thermal Park, one of the largest thermal parks on the island, as well as O' Vagnitiello which is slightly smaller and sits along the same part of the coast. There are also some great walking routes to discover in Casamicciola with its pine forests and steep mountainous areas that are just waiting to be discovered. For any more information about the town please drop us a line and we'll be happy to oblige. Ok, that's all from me today, I'll be back tomorrow with some more about Ischia. Have a great day wherever you are in the world and enjoy the weekend that's almost arrived.